A luxury hideaways, Desa Di Bali is a perfect living space for those wishing to experience authentic Bali up close and personal. Set on the middle of rural Balinese village with breathtaking views of green rice paddies and a sensational atmosphere, the villa is within easy reach of the most sought-after destination on the island to dine, shop and party – Seminyak. No less exceptional is the easy access to the city’s myriad attractions and landmarks such as Echo Beach, Canggu Club, Nirwana Bali Golf Club, and magnificent Tanah Lot Temple. Designed and developed with great respect for nature and local traditionswhile offering the comforts of modern life, Desa Di Bali Villas is also great place to learn about the local way of life, see the way native Balinese people live and to observe traditional ceremonies, cooking practices and more. We warmly invite you to enter a beautiful oasis of Desa Di Bali and feel the authentic Balinese experience with all the conveniences of homeshould be: comfortable,unpretentious, and staff that genuinely wishes to give each guest magical holiday memories. 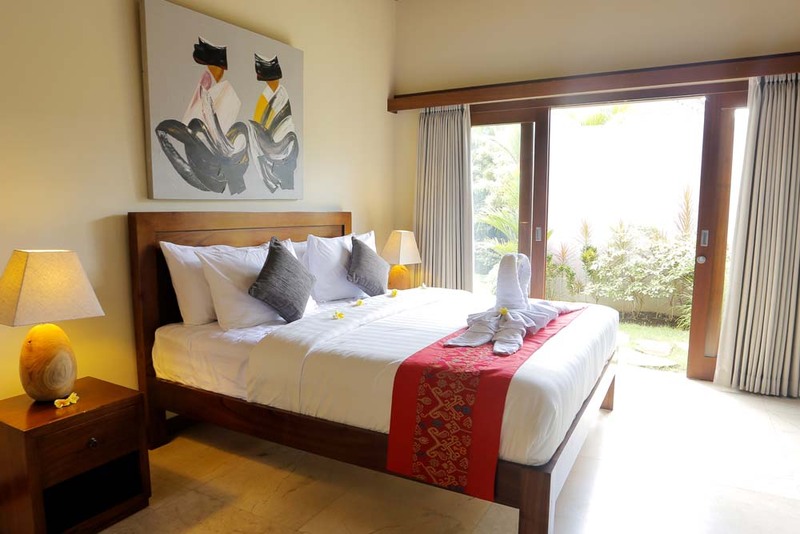 One Bedroom Villa at Desa Di Bali is a stand-alone air-conditioned hideaway, comprising a luxury bedroom with king-size bed (200cm x 200cm), an ensuite bathroom with tropical garden shower, bath tub, and a cosy sitting room with large flat-screen TV. All one bedroom villa has direct access to private swimming pool and small tropical garden at the side. It is ideal for a couple wanting to be near friends staying at either Villa 3 bedroom or other villa 1 bedroom, and serves as a peaceful sanctuary for older family members who cherish their own space. Charming, comfortable and completely private. One Bedroom Villa can be booked in conjunction with other 12 units of one bedroom villa or 2 units 3 bedroom villa. 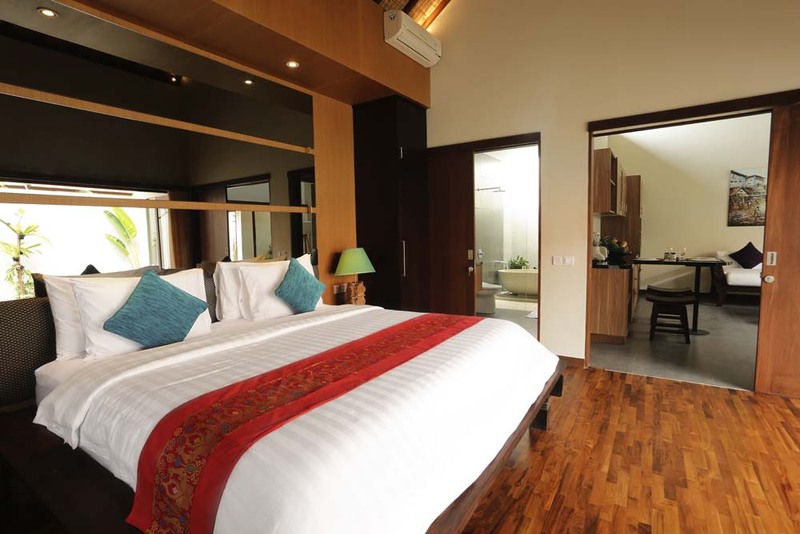 The spacious and breezy living room sits on the side of bedroom facing directly to the tropical garden. Really a comfortable lounges to enjoy your precious moment with partner all the day as it is tastefully furnished with a cozy sofa, unique and beautiful Balinese art work, flat-screen cable TV with both local and international channel, also an air conditioner to cool the living room if needed. There is a small library of books giving an insight into Balinese, Indonesian and Asian cultures. Our central kitchen is located at the edge of the villa complex with a tiny green view restaurant. We cook your breakfast and meal from central kitchen and deliver it to your private villa by our staffs. Although your private villa is equipped with private kitchen, however we want to keep your privacy time, unless requested. Our pair of chefs, experienced in local, Asian and Western cuisine, are on hand to cook breakfasts, lunches and dinners on demand; and always happy to cater to guests’ special requests or dietary needs. The Private Pool is set up in front of each bedroom, whilst on the side of the pool is the open air space with deluxe mattress where guests can relax, reading, or have massage by the pool. In many instances, guests would request to have our staff/butler to cook their breakfast or other meal in the villa. Our professional staff will be ready to assist and cook your favorite meals. Whilst the pool gives you a relaxing moment, our manicured lush tropical garden will warmly welcome you from the front entrance of the villa. Enriched with different varieties of native flora and the manicured lawn, also many varieties of herbs and medicinal plants. The garden bring forth green ambiance surrounding which soothing eyes. What a real treat it will be! Private swimming pool 2,95 M x 2,85M and 1,60 M Depth – a synthetic sun chair and pool towels. 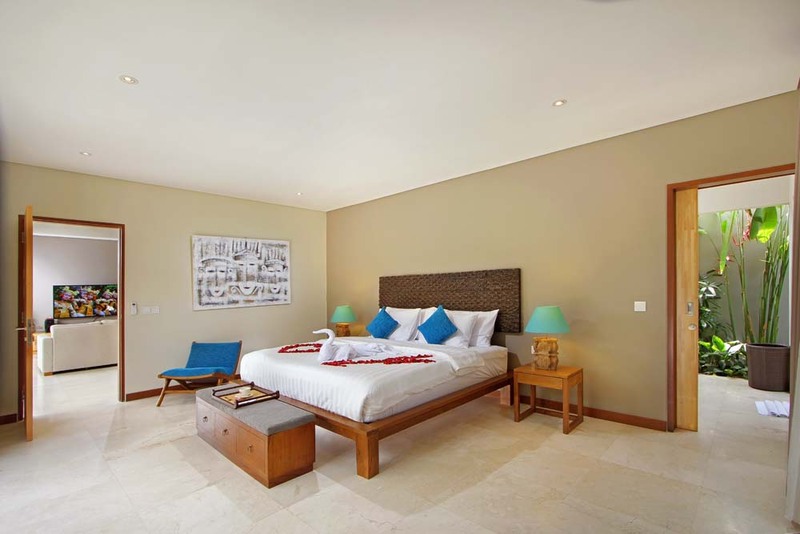 Our 3 bedrooms villas beautifully present master bedroom with king size bed (200cm x 200cm). Sit on the ground floor facing directly the lush garden; the master room has been designed for personal time out with direct access into the pool. 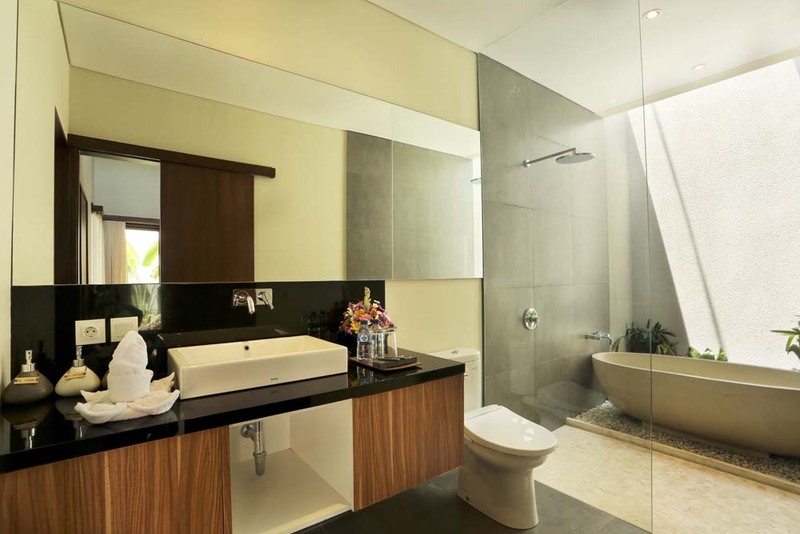 It has exclusive a semi-outdoor bathroom with a separate tub and rain shower as well. The spacious en suite bathroom is also completed with own little garden. This means that whilst you are soaking in the bathtub, the luscious tropical plants will be encompassing you. What a perfect blend of style and satisfaction!